You may or may not be aware of the fact that tree care is one of the most dangerous professions in the world. The employees of arborist tree care and services have to work with dangerous tools like chainsaws etc. at extreme heights. They have to work near infrastructural obstructions, power lines and busy roads which make their job more dangerous. According to various reports people working in tree care sector are at high risk of getting serious injuries and even death. So while hiring and arborist tree care service you should keep these dangerous in your mind and check whether the service provider is properly insured or not. Along with it you should also ensure that the tree care company has updated licenses and certifications of the industry. All these things will ensure that the company as engages properly trained employees as per the latest standards of the industry to reduce the influence of risks involved in their trade. Mostly people get confused in landscapers and tree care companies as both work on trees. But there is great difference in both the service providers as their way of working and risk factors are different. Usually landscapers do not work in high risk conditions like tree care providers, so they rarely care for proper insurance for the risks stated above. So, to hire right tree care professionals to finish your project safely and carefully you should know their types. Normally two types of tree care service providers are available in this trade. Tree Guys are the service providers usually advertise that they are fully covered with workers compensation and liability insurance without understanding actual requirements for these insurance covers. In most cases the claims of fully insured services are false as only few of them are found properly covered for worker compensation and liability insurance. Arborists are usually attached to the associations of the industry and work in really dangerous situations. So they meet the standards of the industry and get complete insurance cover to work in safe environment. The professionalism and level of care of the arborists make them passionate service providers of the industry as compared to Tree Guys. 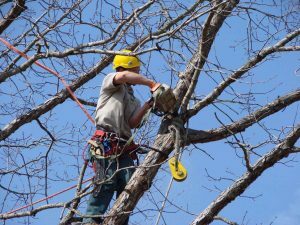 Moreover arborist tree care service providers are committed to advanced training, licensing and certification to serve their clients as per their requirements by using latest techniques. Normally insurance policies for tree care providers include the clause of working height. For landscapers the limit of working height varies from 8 to 10 feet. Their insurance policy becomes invalid if they work over and above that height limit. So, if Tree guys meet an incident while working at the height of 40 feet on a landscaping project then they will not be covered under any insurance coverage and you will have to bear the risk of any mishap. Legally workers compensation insurance is required for the companies having one or more employees excluding the owner of the company. This insurance covers the risk of injuries suffered by the owners and employees if the tree care company while working at a tree care project. This insurance cover protects you from the liability of any injury caused to the workers while working in your premise. Legally the responsibility of work injuries has to be taken by the tree care company but if the company does not have workers compensation insurance then you will have to bear the cost of treatment of the employee injured at your work. You can recover these expenses from the company by suing it but in the meantime you will have to pay all the medical bills along with costs and wages loss of the injured employee. So, while hiring the tree care company, if the contractor claims that he do not require worker compensation cover due to leer numbers of employees than minimum limit then you will be liable for such expenses in case of any mishap on your work project. The terms will be the same, if the injured person is an employee to the tree company or its owner. There is no other option for you. How to keep you safe? In order to protect you from the liabilities of workers compensation and other similar situations you will have to look for certain items while hiring the company to ensure your coverage in case of some incident while working in your premise. The contractor can also add you as the certificate holder or additional insured person free of cost. Both the owners of the properties should be listed in some cases while working on a property. In order to ensure the genuineness and reliability of the policies listed in the certificate of insurance you can also call the listed insurance companies to confirm as the certificate provided by the company can be fraud. You should find out another service provider if the company takes this request offensive. You can also check whether the company is accredited by the association of the industry which means the company strictly follows the safety standards and best practices of the tree care industry required by insurance provider company. You can also ask about the certification of thee employees and validation of the credentials of the company from the website of the tree industry association. Only licensed Arborists can legally do most tree care works in US. You can call the references provided by the reputable tree care contractors to know their quality of work from their previous clients. You can also check the reviews at social media as well as BBB to ensure the work standard of the company. Thus you can hire reliable arborist tree care and services by following the tips provided in this write-up.